That was the same year that this year’s honorees, Ana and Juan Gershanik, left Argentina to make a new life in the United States. The awards lunch will be on Sept. 26 at the Westin New Orleans Canal Place, with a cash bar opening at 11:30 a.m. and lunch at noon. The Gershaniks arrived in Miami as newlyweds in June 1966, prepared to spend a year there so Juan could do an internship in pediatrics. Two weeks later, a military coup ousted Arturo Illia, “the most honest president that Argentina ever had… and things started going down the hill,” Ana said. Friends and colleagues urged them to stay in the U.S., so after the year in Miami they moved to Lexington, Ky., to do a two-year residency and specialize in neonatology. Ana revalidated a teaching degree and taught at a Catholic school near Miami, then in Lexington. 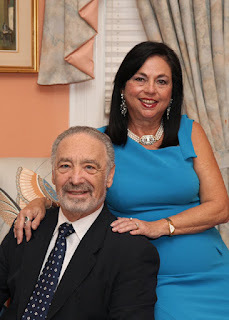 In 1969 they moved to Charleston, S.C. so he could do a two-year fellowship in neonatology, and she became the first female teacher at a prestigious private high school for boys and enrolled at The Citadel to pursue a Master’s in education. In 1971, Juan was hired as a professor at Louisiana State University Medical School in Shreveport, where he developed the first Neonatal Intensive Care Unit in the state. In 1979, he was recruited by Southern Baptist Hospital in New Orleans to develop a similar unit there. Shortly after moving to New Orleans, Juan became involved with the Hispanic programs of the Council on Alcohol and Drug Abuse. “I realized the importance of the prevention efforts specially at the high school level, as well as the need for services to the growing Latino community,” he said. She continued her volunteer work in New Orleans through NCJW and the Symphony. “The activities that I found most rewarding were the resettlement of Russian Jews and the resettlement of Marielitos, as well as starting new programs of music enrichment in the public schools of New Orleans and Jefferson Parish,” she said. Reservations are $65 and can be made here by Sept. 16.